President Rodrigo Duterte met Vice President Leni Robredo for the first time at the Armed Forces Change of Command ceremony at Camp Aguinaldo on July 1. The meeting was described by VP Robredo as "very cordial". The two highest officials of the land were seen laughing together and having a lively interchange. Duterte appeared to be pleased with the meeting. At one point , the President even offered Robredo the coconut juice drink he was about to sip from, showing her just how much of a gentleman he is. During his speech, Duterte said, "Vice President Leni Robredo... this is my first time to meet you personally." That simple statement was met by a round of appreciative applause from the event attendees. 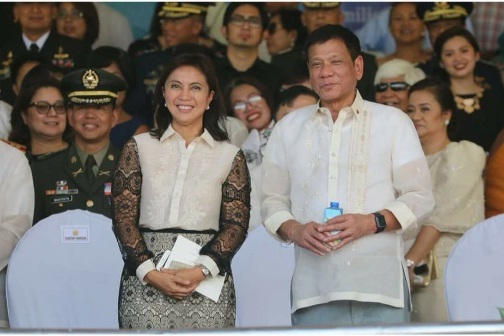 Robredo was all smiles when Duterte greeted her thus. Outgoing acting AFP Chief Glorioso Miranda was seated between Robredo and Duterte during the ceremony. But the seating arrangement did not prevent the two from having a conversation. Judging from the crowd reaction during the event and the comments and posts by netizens on social media, the first Duterte-Robredo meeting was met with enthusiasm. A lot of netizens were thankful and said their unity is for the good of the country. Finally. Sa totoo lang they could be the best tandem kung hindi lang hahaluan ng pulitika. Team DIGNITY (DIGong-leNI-uniTY).Mukhang maluluma na ang ALDUB neto. @lenirobredo when #PresidentDuterte took his oath I was jubilant, & this time may tumusok po sa puso ko. @RRD_Davao & #VPLeni, God bless po! @lenirobredo sana tuloy tuloy na yan sana magkasundo na kayo. Duterte and Robredo got off to a rocky start when the former said he could not give Robredo a cabinet position because it would offend his friend, Sen. Bongbong Marcos. For her part, Robredo said she respects his decision. In her speeches, Robredo indicated that the lack of a cabinet position will not hinder her from fulfilling her campaign promises which focus on helping those who are at the fringes of society. After their first meeting, Filipinos are hopeful that Duterte and Robredo will put country above personal friendship or party affiliation. In their separate inaugurations, both Duterte and Robredo spoke of unity in their speeches . We do hope they walk the talk, so to speak. Having the same end goal of uplifting the life of Filipinos, most especially the poor, it would not be hard to join forces ASAP.